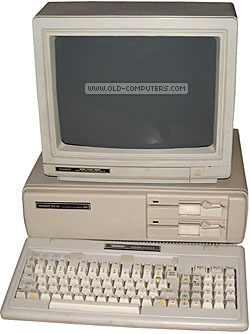 The Tandy 1000 SX was similar to the Tandy 1000 (see this entry for more info about the Tandy 1000 series). The difference with the original model 1000, is that the CPU (Intel 8088) can be set to two different speeds: 4.77 MHz and 7.16 MHz thus offering more speed than the original IBM PC on the same software. The SX also comes with more memory (384 KB) than the Tandy 1000 (128 KB). PERIPHERALS memory expansions, internal modems, 20 MB hard disk, etc. see more Tandy Radio Shack 1000 SX Ebay auctions !